Hyderabad, Jan 31: Taiwan-based communication giant Foxconn Technology Group has decided to set up its Advanced Industrial Artificial Intelligence Research and Development Centre at Hyderabad. On Wednesday, officials of Foxconn Industrial Internet Co. Ltd called on Jayesh Ranjan, Principal Secretary to the Government of Telangana and held discussions on the ambitious venture. Informing about the agreement, former IT Minister and TRS working President KT Rama Rao took to Twitter and wrote, “Delighted that Foxconn Industrial Internet Co. Ltd. (FII), a subsidiary of Foxconn Technology Group, has chosen Hyderabad to set up an Advanced Industrial Artificial Intelligence Research and Development Center”. 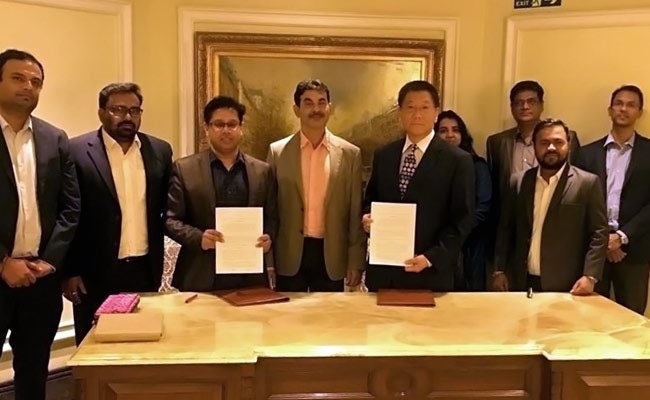 The official pact was signed in presence of Michael Yang Director of Business Development of Foxconn Technology Group and Sujai Karampuri, senior officer and Director of Electronics, Telangana government. Foxconn Technology in association with Telangana government will jointly work on the sectors like cloud computing, mobile devices, IoT, big data, AI, network transmission, and automated robotics. Foxconn Technology Group is a leading player in communications network equipment, cloud service equipment, precision tools, and industrial robots.